Using words in context and modeling inquisitiveness is far more effective. So, I'm sitting in a workshop on vocabulary development listening to a bunch of research as to why kids lack the language to effectively comprehend and communicate. The largest factor (found by this specific research) that determines a child's vocabulary cache is . . . (Drum roll) . . . In-home communication between adult and child using rich language. No talking, no vocabulary -- makes sense, right? The more you hear it, the more likely you're going to use it, the more you're going to "own" it. It's the purest form of contextual usage. It's life. This makes total sense to me. As a teacher, writer, and father of a three-year-old, I'm always exposing my son to strong, healthy vocabulary. It's not rocket science; it just takes some extra effort to recognize those special times to work on vocabulary (I'm not using the term "teachable moment" here because working on vocabulary really shouldn't seem like a formal lesson; it should be as natural as a friendly conversation). Let me give you a play-by-play to give you a sense of how I do it at home. Setting: Playing in the backyard. Me: Yes, the temperature is going up. Me: The temperature is increasing. Now, Max is three and some change, so he's not really absorbing all of the words. I know that. I don't expect him to remember the words right away. I'm planting "word seeds" to grow over the years. He will eventually know that "going up," increasing, and rising are all related. Vocabulary development doesn't happen overnight; with food and water, vocabulary will slowly grow like a big, old oak tree reaching up to the sky. I left the workshop thinking about how I personally teach vocabulary without making it seem like I'm forcing new words into the absorbent brain tissue of my students. The key to "real-life-like" vocabulary instruction is not to force it. Let it happen, my friend (like a friendly conversation). Avoid fill-in-the-blank worksheets, matching, and vocabulary quizzes at all costs. Forcing students to quantify their learning in a quiz or test sets the brain to stun, not kill (Stun= regurgitated-on-paper-never-to-be-used-again. Kill= embedded-and-owned.). In his book, On Writing, Stephen King states that vocabulary should be on the top shelf of your writing toolbox, and "Don't make a conscious effort to improve it." To the beginning writer and teacher that might sound weird. However, Stevie continues with, "You'll be doing that (improving vocabulary) while you're reading." Ah-ha! Now we're talking; now we're learning new vocabulary on the go, in the field, and LIVE (naturally). But how do we get kids to do that? Patience. Teaching kids new words and definitions is very important, but what's more crucial to ongoing vocabulary development is modeling when and how to be inquisitive about words. Here are a few "moments" that I use to model how to naturally investigate words and directly teach them as well. 1. 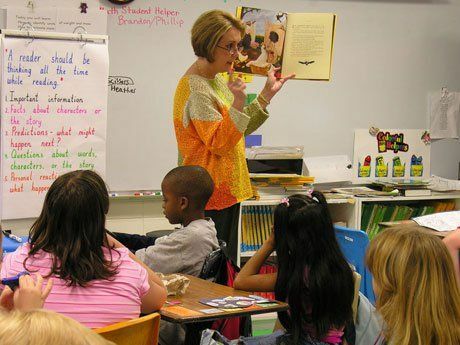 Read Aloud: I read out loud to my students every day. Please, oh please, don't ever cut this from your daily routine. It's so important for kids to hear how words and punctuation intertwine to create a coherent story. This is a great time to discuss the word choice of the author, the good and the bad. I like to use the think-aloud technique to show students how I mentally investigate words. Gaetan's mental thoughts: wait a minute -- what does that word mean? Re-read the sentence..okay it could be... but maybe not. Do I see a pre-fix or a suffix? I'm sure you get the idea. When parents ask me how they can help their child improve their reading, I tell them to investigate a word a day that appears in their reading homework and plant the "word seed." 2. Reading/Writing Conferences: Individual reading/writing conferences are the epitome of differentiation. This is where a teacher can really access student needs and meet them at their wordsmith level. Along with discussing words, for those of you who need something concrete and documented, "the list" is always a good idea. I have my students create individualized spelling lists and vocabulary lists in their writing journal, which are updated during conferencing or just on-the-go. I also create class lists of good words, such as "Buff Verbs" and "Instead of Said" words (speaker tags). It's always nice to have a reference. 3. Poetry: Almost everything a student needs to know about reading and writing can be taught through poetry. The poem is very versatile: its length is less intimidating than a short story or novel; poets usually use strong words (they have to because of the length); the definitions of the words can usually be deciphered through context clues; and, although poems are awesome fun to use, make sure you use age-appropriate poetry. We all know poets can be "out there." Sometimes after reading a difficult poem we all kind of just stare and "Dig the Heaviness." That's really all we can do. I try to "unpack" at least two to three poems a week, digging out some good words to discuss. 4. Morning Message: If you are into the responsive classroom thing, you can definitely use the morning message to increase the student word power. When I interned at the Nancie Atwell Center for Teaching and Learning (read my blog of the experience: Five Practices that Transformed My Teaching), I was amazed at how Ted DeMille, 1st/2nd grade teacher, taught with the morning message. He started with phonics and ended with comprehension. It was quite amazing. Contextual vocabulary acquisition is the most effective way to get words to stick, but it takes time and patience. Just think about how toddlers learn to speak. They learn from adults, brothers and sisters, and their peers over several years of listening. They don't learn from worksheets or memorizing word lists. Their word acquisition begins by listening, and then moves to learning from books and conversation. Although teachers will never make up for lost home-life vocabulary development, they can make a huge impact on their students by consistently planting those "word seeds" in a natural, conversational way.